Before I tell you about the Top Bars in KL, I should explain that I am not an expert on KL nightlife. Most nights, I would sooner stay at home with a good book or a Poirot video. But when I do go out I prefer to have a couple of beers in a smart bar, probably in a hotel, with comfortable seating, attentive service and where the music is not too deafening. I recently had a good friend visiting KL. He knows a thing or two about bars, having spent a sizeable chunk of his adult life in them, so we took the opportunity to invest a couple of days researching KL's bars with a view to compiling a list of the Ten Top Bars & Cocktail Lounges for the Mature Thirsty Traveller. We were not successful in identifying the Top 10 but here is a short review of the places we patronised (in no particular order). Anyone who is familiar with the Coliseum will think it very odd to include it on a list of Top Bars. The Coliseum is shabby, run-down, grubby and with indifferent service. All true but it is a KL institution which has been around since 1921. 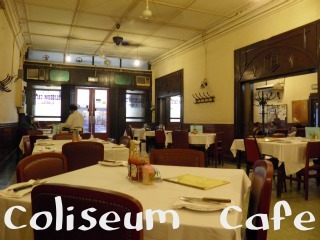 For visitors interested in history who feel nostalgia for old Malaya or want to imagine what life must have been like for an off-duty planter, the Coliseum is a must-visit. 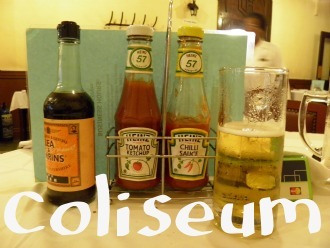 Heritage lovers have a duty to spend money at the Coliseum so that it can remain in business. It will be a sad day if and when the building is pulled down. The food served was a mix of standard Western fare (with British touches like sliced white bread and butter) and staple Asian dishes. The customers were made up of European tourists, expat business people and locals keen to soak up the 'exotic' Colonial atmosphere. They serve a fine chilled draft Tiger and, after staying for one or two more beers than was strictly necessary for research purposes, we even managed to get a smile out of some of the notoriously impassive waiters by the time we left. By way of contrast we tried out the sleek and trendy Sky Bar on the rooftop pool-deck of the Traders Hotel. This place has received awards for being Best Malaysian Bar or similar for its chic atmosphere and superb views of the night skyline of KL, including a close-up of the glittering Twin Towers. We wanted to see if the place lived up to its reputation. Well it did have great views and it was very smart but for old fogeys like us we didn't rate it highly. For a start the bar had a swimming pool right in the middle of it. A nice idea perhaps to combine a pool and a bar but you certainly wouldn't want a bunch of English drunken hooligans in the place. The pool would rapidly fill up with cigarette butts, nuts, glass bottles and vomit. The music was way too loud and modern for our taste. The staff were friendly and efficient but perhaps over-familiar. Some might say it is one of KL's top bars but we won't be going back in a hurry. This is a lovely-looking hotel recently constructed in traditional Malaysian architectural style. No expense has been spared on its decor. Unfortunately there did not appear to be a proper bar or, if there was, we could not find it. We have since been back a number of times and have located the bar, in fact two. Just off the lobby is the Lanai Lounge, a relaxing place to enjoy a cocktail or coffee, served by elegantly costumed waitresses. They have a piano player. Also on the ground floor is the Heritage Club, a large and lively bar in the evenings with comfortable seating, attentive bar staff and, after 9pm, live music. One of the bands was called the Honey Beez and made up of seven enthusiastic and energetic Filipina girls. A contender for the top bars list. 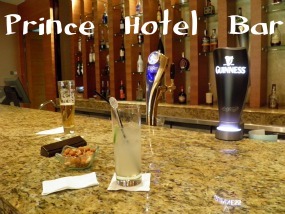 The Prince Hotel had a bar on the Mezzanine floor. It was nothing special in terms of decor (perhaps getting a little dated but that is OK for us mature travellers) but the bar stools were very comfortable and the bar staff were friendly. The Flo is no more! The Equatorial Hotel has closed down and is being demolished. This probably explains why the staff were not at their best last visit. A new Equatorial will rise again on the site in a few years time. Hopefully it will have an even better bar. This bar is quite famous (notorious?). From the outside it resembles a thatched beach hut and in the evenings it apparently houses a bar scene which is more reminiscent of Thailand than Malaysia. Even during our visit, which was in the middle of the afternoon, it was populated with a few dodgy-looking women from the world's oldest profession. The baby sharks in an aquarium above the bar were not the only creatures cruising the place on that day. We drained our Coca Colas and moved on. The Havana Bar in Changkat Bukit Bintang was a pleasant enough bar/restaurant with a slight Cuban theme. The Spanish Grand Prix was showing on their big screen TVs. Quite clever of the bar management to show the Grand Prix - they know that a lot of people will stay to watch the entire 66 laps. The bar staff were very fast at replenishing our beers meaning that we probably ended up staying longer, and drinking more, than we intended. We then crossed the street to a tapas bar whose name I failed to record (blame it on the beers!). Considering that the waitresses were from Myanmar they were quite knowledgeable about tapas. This was a big disappointment. We were told by the concierge that the Ritz Carlton does not have its own bar and that we should go to the neighbouring Starhill Gallery instead, which we did. It was a circular bar on the lower ground floor of the Starhill with a live band performing on a nearby stage. It was OK but the atmosphere was more like a shopping mall than a bar. 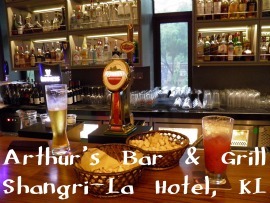 The Shangri-La Hotel has refurbished its former pub and recently re-launched it as Arthur's Bar & Grill. It definitely deserves a place on my Top Bars list. I cannot comment on the food (although the menu looked very good) but the bar area had a pleasant ambience, with comfortable seating and live music. The charming and efficient female bar staff wore the most eye-catching uniforms of any bar we visited - hot pants and trilby hats (looked better than it sounds). The bar's Maitre D, Mr Charli, was on hand which is always a good sign if a hotel wishes to maintain its service standards. We revisited this bar in February 2012. The bar staff seemed to have lost their trilby hats.They were still efficient but not as charming as on our previous visit. We tried the food this time. Both of our dishes, Seafood Mee Mamak and Cobb Salad, were tasty an good value. A talented Filipino band started around 9pm. We expected a good bar at the top-notch Mandarin Oriental Hotel and we were not disappointed. Located next to the elegant Mandarin Grill, Mo's Bar comprises a compact but luxurious bar counter and sumptuous lounge seating overlooking the hotel's exquisite garden. Definitely one of the city's top bars. Since the Hotel Maya has good reviews as a place to stay I thought it might be worth seeing if any of their beverage outlets should be included in the list of Top Bars. Sadly the Martini Bar on the ground floor had neither staff nor drinks while the Sky Lounge restricts access to hotel guests only. After a wasted trip, we left the Maya with wallets intact and thirsts unquenched. The Rennaissance is a large and smart hotel dating from the 1990s. Its sports-themed bar, the Mezzo Bar & Lounge, was probably designed around the same period and feels a little dated but the barman made a good effort and there was a decent match on the TV screens so we were happy enough. That completed our somewhat random survey of Top Bars & Cocktail Lounges for the Mature Thirsty Traveller. It is incomplete and we were not successful in identifying a Top 10 but there is a limit to the number of bars you can try out in just 3 days. I will continue my research and write an update in due course. 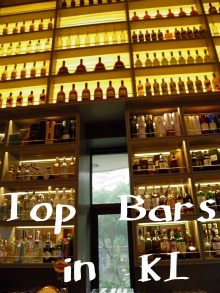 In the meantime perhaps you have your own suggestions on which bars should be included in my Ten Top Bars List. Please feel free to submit your comments below.